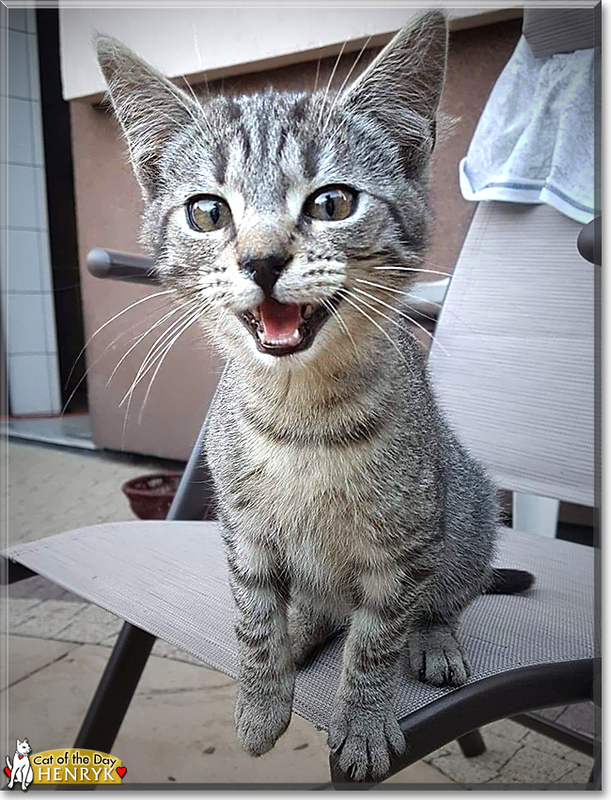 Congratulations on being honoured as Cat of the Day, Henryk! What a cute little guy you are, Henryk, absolutely precious! Your mixed tabby coat is beautiful and so are your golden eyes. I LOVE all your adorable pictures. Your mom is a smart kitty, she took you to a nice family to get you help with your health issues, and they made sure you got the medicine you needed. And your own mom still visits from time to time to keep an eye on you and see you grow up. Wonderful! love, and you just can’t get enough. You are already learning how to grab your ball, standing on your hind legs… I bet you look adorable! Soon, you will be on the kitchen counter, too. Enjoy a day of fun, playtime celebration. Get pampered with extra yummy treats and lots of cuddles. I send you kisses and wish you good heath, love and happiness for the rest of your life, sweetheart! Last edited by Randi; 10-24-2018 at 12:59 PM. Henryk being part of our family wasn't actually our idea. One day his mother, a wild cat, walked to our garden with a small ball of fur, which appeared to be Henryk. He was so small that at first we didn't know what we are supposed to give him to eat. At first, they both were spending time at the very end of our garden but from day to day he became more courageous and eventually allowed us to pet him. His mother visits us from time to time, but Henryk stayed with us permanently. Sadly he was suffering from an illness. We gave him some medicine and slowly he recovered and at the same time get used to us more and more. Now, after a few months, he is always with us, he has his own chair and sleeping pillows. He loves to be carried on our hands and to be petted. When someone stops petting him and he thinks that this was definitely not enough, he puts his head under our hands, forcing us to pet him more and more. Otherwise he meows sadly. And when we are giving him food he tries to jump on the table, he stands on his hind legs and generally makes a lot of noise until he gets his bowl! He also likes laying in an old basket and playing with his toys - he can stand on his hind legs and grab his ball using his front paws, which is totally cute. Hello, Henryk in Poland! Happy Cat of the Day! What an absolutely adorable kitten you are! I like your wonderful tabby markings and your beautiful eyes! Your fur looks so soft - I would be happy to pet you for as long as you wish! Since I can't, though - I hope your people will give you some extra petting for me! Your cat mom brought you to your caring family, and still visits the garden from time to time. I hope she will allow herself to be adopted too. You are a busy kitten - playing with your toys, requesting extra pats when you need them, and talking to your people at meal time! And being a camera star, too - I enjoyed looking at all the photos of you! 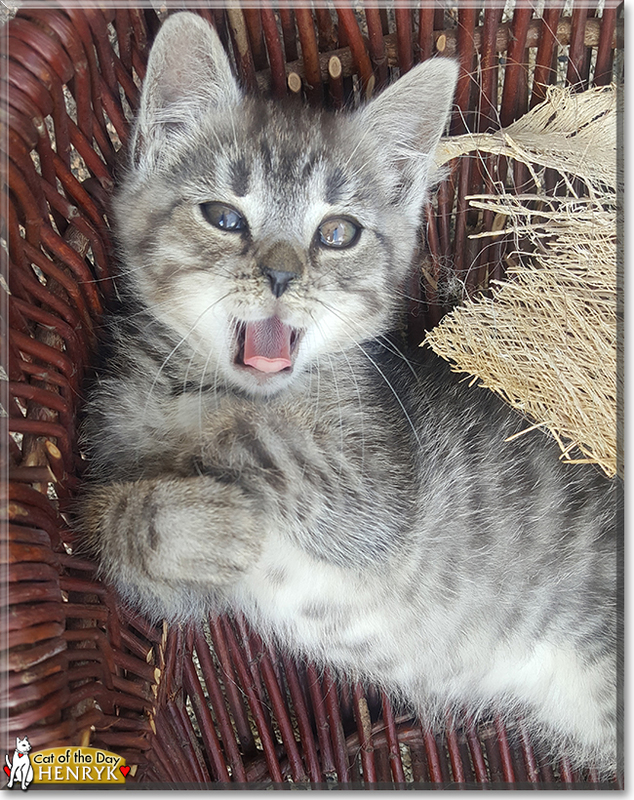 Happy, happy Cat of the Day to darling kitten Henryk! Love to your cat mom too! Henryk is awsome! He is just totally cute, adorable and perfect! Every photo is cuter than the next, Henryk is the most wonderful, extra special COTD! Dearest Henryk, you are adorable, indeed! What a sweet young boy you are! That colorful tabby-mix fur is so pretty and looks so soft, and what a sweet face you have with that dark nose and the long whiskers and those lovely big eyes. Thank you for sharing that terrific photo collection with us! You are adorable in every one of those pictures, which show so many different activities and moods of yours. I wish I could reach through the screen and across the ocean to Poland to pet you, and pet your mother too! I can't, of course, but I know your loving and beloved persons will pet you both for me . And what an amazing story you have to tell! One day your mother walked into a garden carrying a small bundle of fur, which turned out to be you. At first, you both stayed at the end of the garden, but you eventually became braver and let the people pet you. Your mother visits from time to time, but you've moved in with your new family permanently. You were ill at first but recovered with good care and medicine. Now you are with your people always and have your own chair and sleeping pillows. You love to be carried and to be petted. You tell them when you want more petting and when you want your food. You love laying in a basket and playing with your toys. I'd love to see you standing on your hind legs to grab your ball with your front paws! You and your dear mother and people all love each other very much, don't you. What a delightful love-filled home you share! Congratulations, darling Henryk, on being chosen today's Cat of the Day! We hope you and your dear mother and people and all your family and friends are enjoying a fine celebration, full of fun and lovies and all your favorite games and treats. Last edited by phesina; 10-24-2018 at 09:08 PM. Greetings, Henryk! Happy Cat of the Day!!! Meeting your beautiful, baby Tabby x self this evening, reading your human's love filled tribute, has been the perfect antidote to my long, tiring, cold and rainy day! But to be honest, you had me at with those photos! Be still my heart!!! Major kudos to your human for capturing you in all of your feline glory! And suffice it to say, you sure know how to mug for the camera, sweetheart! *swoon*!!! And what a smart boy you were, choosing this family to be your very own! You may have started out feral, but with one paw in the door, you knew you were home to stay! And oh, what a happy, care free, pampered life it is! Now that's what I call living the good life! So happy to hear how handily your recovered from your illness, sweetheart! And now, nothing but blue skies and happy times from here on in! How lucky your humans are, having a beautiful, sweet and loving best furkid in you! What fun they're in for over the months and years to come, watching you grow and learn, sharing countless happy times, making memories to last a lifetime! You truly are a treasure, Henryk, just as special as can be, and so very worthy of your big day of honor! Thanks for the BIG smiles, sweet baby boy! Meeting you has been a joy! Hope you enjoyed a very special Cat of the Day celebration...napping in your basket and playing with your toys, receiving countless pets and cuddles, being loved and pampered to pieces by your proud humans! 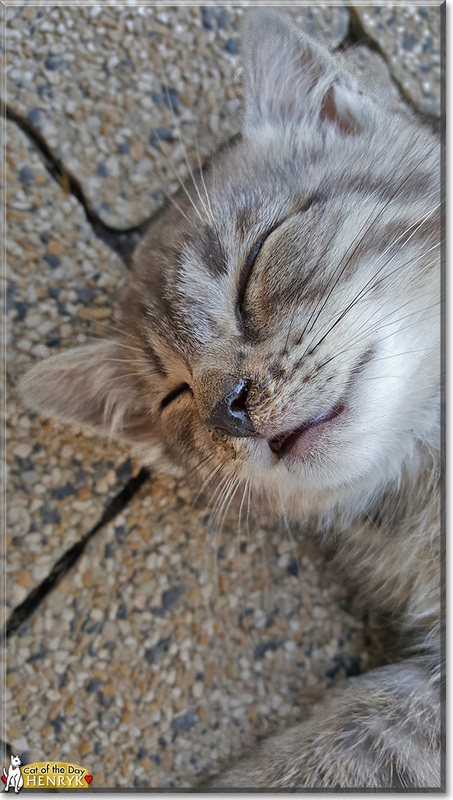 Lots of love, snuggles and smooches to you, adorable Henryk, our very special and most deserving Cat of the Day, EVERY day! Love to your dear fur mommy, too! Dear Henryk, what a handsome tabby boy you are. You look so soft and fuzzy, and your sweet face couldn't be more adorable. Each of your pictures is more adorable than the next. Your little basket looks like it was made for you! I'm glad that your family started taking care of you when your mom brought you to them. They also made sure that you got your medicine, and now you are a healthy, sweet and active kitty. You have lots of places to sleep, and you can't get enough of being petted, you will actually demand it . And, of course, you don't miss a meal. You jump on the table to make sure that dinner is served. Henryk, you are precious beyond words, and I wish you and your family a great day full of celebration, and many more happy and healthy years together. 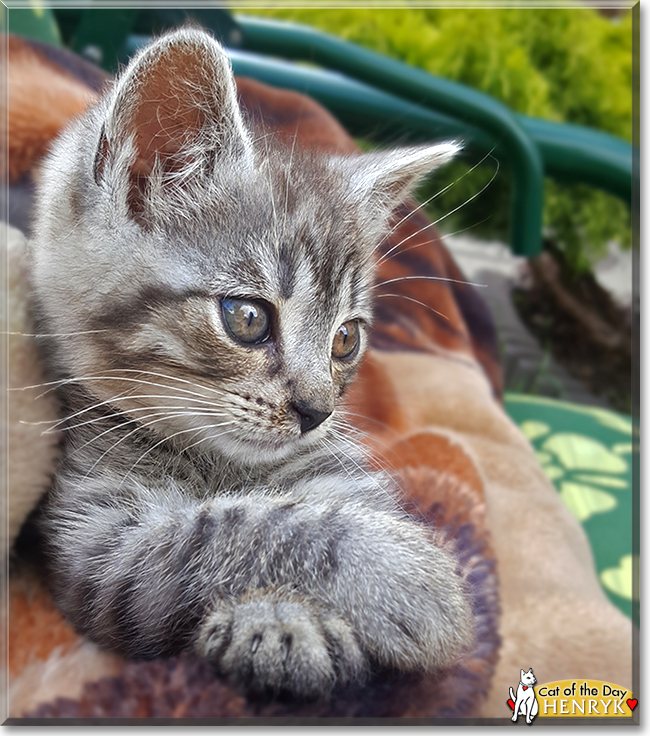 Congratulations on being Cat of the Day, Adorable Henryk!